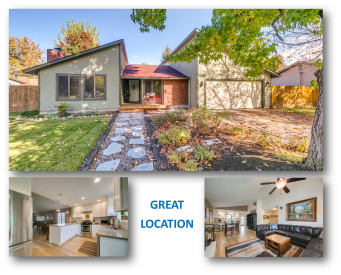 Entertain in this exceptional & affordable single level home in a coveted SE Boise Location! Remodeled Kitchen complete w/shaker cabinets, quartz counter tops, LG SS Appliances & range hood, single basin under mount sink, subway back splash, drop pennant lighting, bar area & enlarged walk-in pantry! Extensive white oak flooring, spacious & vaulted family room with fireplace, remodeled master bath, private rear yard w/no back neighbors, shed, side boat parking, pressurized irrigation,220V @ garage & no HOA fees! GREAT LOCATION!